The Bread and Puppet Theater will be coming to Tucson for the first time in over 30 years as part of a 14-week tour across the country. It is one of the nation's oldest political theaters and originally started in New York City in 1963 before moving to Vermont in the 1970s. The internationally celebrated company includes performances with art, music, and dance. The shows are both political and creative, known for their huge puppets made of papier-maché and cardboard material. On Nov. 11, The Grasshopper Rebellion Circus theater performance will demonstrate riot and rebellion against intolerable situations with state of the art papier-maché weaponry and the Bread and Puppet Brass Band. Bread and Puppet will also be providing its famous free sourdough rye bread with aioli. Books, posters, postcards, pamphlets and banners from the Bread and Puppet Press will also be for sale at the event. See the Bread and Puppet performance on Sunday, Nov. 11 at 4 p.m. 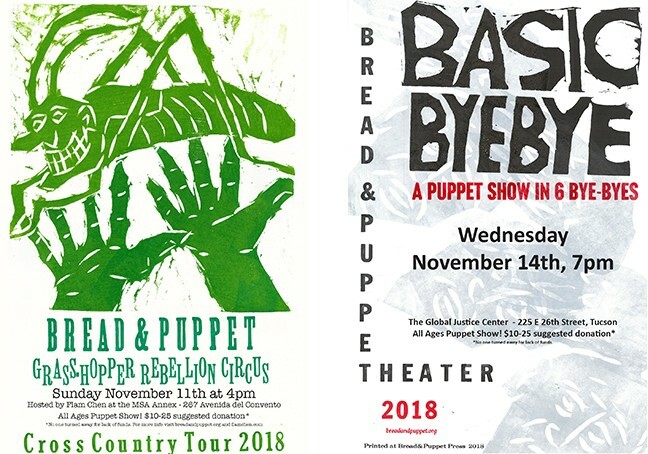 The Bread and Puppet Theater is making their trip to Tucson worth the travel by putting on two shows while they are here in town. Bread and Puppet's Grasshopper Rebellion Circus will be on Sunday, Nov. 11 at 4 p.m. hosted by Flam Chen at the MSA Annex located on 267 Avenida Del Convento. The second show called Basic Bye Bye will be on Wednesday, Nov. 14 at 7 p.m. at the Global Justice Center located on 225 E. 26th St.